Ginger: From the fencetops I sing my love. Come and play wif me. Mika: OI! You in Mika's garden! Pissoff! Mika: PISSOFF!!! This is Mika's garden! Mika: Gonna punch you, tresspasser! Mika: Yeah, gonna stare you down, chump. 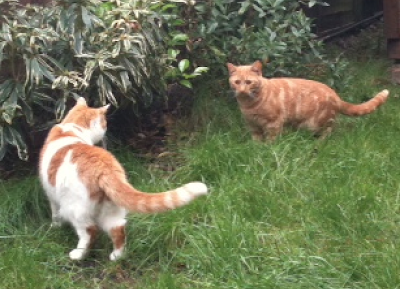 Ginger: Such is the beauty, I sigh among the grass. Good to know that Mika is dealing with the AV referendum defeat in her own inimitable way! Hmm... Is Mika spayed? That would tend to make the course of kitteh love most rocky. What Ginger needs is a quest to share with Mika. I propose they join forces to rid my back garden of the Grackle Menace, especially since my two rat terriers aren't achieving this goal.